During August, fashion and beauty elite showed up to the runway feature of the season, taking their seats front row at a greenery-filled David Jones SS18 Collections Launch. “The beauty look for the SS18 David Jones Collection is inspired by the clashing colours and textures of spring time and the celebration of diversity in beauty’, says Victoria Baron, SS18 Makeup Director. “Spring is a time of growth and renewal. There’s a huge focus on skin health and preparation for a fresh, hydrated and youthfully luminous complexion. Natural flushes of earthy bronze tones on the cheeks and eyes, brows are free and organically brushed, lashes are defined and lifted. 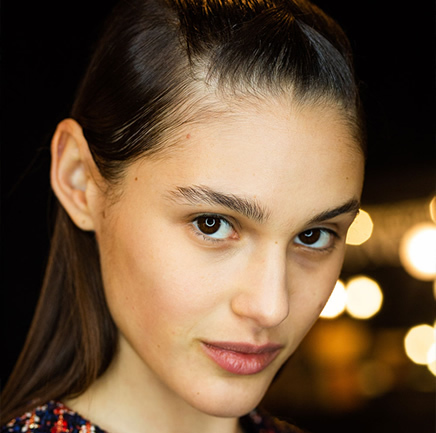 Commercial fashion and must-have, salon-ready, consumer-friendly hair hit the runway and set the trends for what’s to come over the next six months. 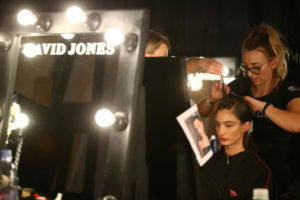 Aveda’s National Style Team, led by Creative Director Terri Robertson-Kirkwood, created the hair look for the David Jones SS18 Collections Launch. This rejuvenated beauty look takes influence from the first hint of spring, bringing fresh energy, inspiration and the promise of possibility. While simplistic the look has a strong innovative elegance that compliments the vibrant SS18 collections. “This hair look is all about deep conditioned, beautiful, healthy hair and this is reflected through the lustre and shine that has been created, which is also a current demand we are seeing from consumers”, says Aveda’s Creative Director for David Jones, Terri Robertson-Kirkwood. “We are seeing a trend for hair that is simplistic, as well as a desire for visually healthy and shiny hair. The Aveda styling products used help sustain this health and shine on the runway, regardless of hair type or texture,” she said. This launch showcased the very best of Australian designers and leading international brands. 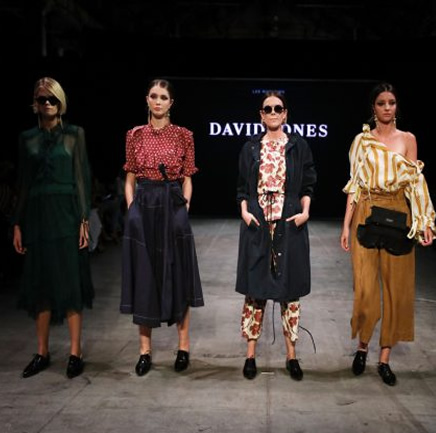 David Jones Ambassadors Victoria Lee and Jessica Gomes were joined in an all-star line-up including renowned international supermodel Karolina Kurkova, international model and celebrity offspring, Anwar Hadid, and our Adelaide local turned international model, Adut Akech. The fashion featured on the runway included a range of exclusive Australian and International designers and SS18 trends. Some of these brands included, Jets, Zimmerman, Bec & Bridge Swim, Bianca Spender, Rachel Gilbert, Manning Cartell, Carla Zampatti, Ginger and Smart, Nerida Winter, Balenciaga, Chloe, JW Anderson, Mansur Gavriel, Meadowlark, Sans Beast, and Reliquia to name a few. PREP use a coin-size amount of Aveda’s Daily Hair Repair this leave-in treatment will instantly repair and protect from heat styling. Run the product through mid-lengths and ends. Spritz damp hair with Aveda Thickening Tonic for finer hair, to create a fuller style OR use Aveda Volumising Tonic on all other hair types to help build body and add shine. STYLE with 2-3 pumps of Aveda Phomollient Styling Foam and distribute evenly. This will create weightless body and volume for your blow dry. Using an Aveda Paddle Brush blow dry the hair away from the face. PRO TIP: Choose a slow-speed with high heat to give more control and help you create a smooth blow dry with less flyaways. Take a section from the front hairline to the crown and hold (about 5cm wide), while leaving out the first centimetre across the hairline. Spray the section you are holding with Aveda Control Force Hairspray until the hair is damp. Brush through hair spray and lay flat on top of head, then secure with section clip. Take remaining hair at hairline and spray with Aveda Control Force Hairspray and twist, then secure with same clip. Tuck remaining hair behind ears and brush to smooth hair down at the back. Use a pea size amount of Aveda Split End Repair to the ends of your hair to add extra polish, binding any split ends back together for healthy, touchable hair. Once dry gently remove the clip. The strong hold hairspray will keep your twist in place. FINISH by spritzing entire style with Aveda Sun Care Hair Veil to add sun protection and extra shine to the hair.